The Valve Inspection article provides you with information about the inspection of valves and valve testing in the manufacturing shop as well as in operational plants.You may review valve inspection procedure and valve ITP articles. 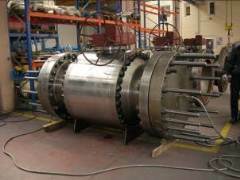 Valve Shell Test or Body test is performed after successful completion of valve individual components e.g. seat, disc, body, stem, etc. inspection and assembly. The test is conducted by valve manufacturer and based on the requirements of API STD 598 ( Valve Inspection and Testing). The valve shall be partially open and be able to hold pressure for certain time. The pressure shall not be less than 1.5 times of maximum working pressure. No leakage is allowed. The Valve Seat Leak Test (Closure Test) is performed after successful completion of valve shell test (Body Test). One side (valve inlet or outlet) shall be subjected to the hydrostatic pressure and amount of leak shall be measured on the opposite side of the valve. It means if you are pressurizing valve inlet, then you have to measure the amount of leakage in the outlet. The limited amount of leakage is permissible. The Valve Backseat Test is performed in the valve with backseat feature. This is a feature that allows valve packing being replaced while it is in the service. In this test, valve shall be fully opened and packing gland shall be loose or not installed. No leakage is permissible in backseat test. Pressure Safety Valve Inspection - Are you looking for information about pressure safety valves inspections during the manufacturing process? Or you are looking for in-service inspection in an operating plant? The pressure safety valve is a direct, spring-loaded pressure-relief valve that is opened by the static pressure upstream of the valve and is characterized by a rapid opening or pop action. When the static inlet pressure reaches the set pressure, it will increase the pressure upstream of the disk and overcome the spring force on the disk. Fluid will then enter the huddling chamber, providing additional opening force. This will cause the disk to lift and provide full opening at minimal overpressure. The closing pressure will be less than the set pressure and will be reached after the blowdown phase is completed. This article covers both shop and in-service inspection of the pressure safety valve. Third Party Inspection for Valve - This content guides you through all the necessary stages in the production of the valves, from the examination of certification of procurement sources to the final inspection, preservation and packing, to the dispatch to site.